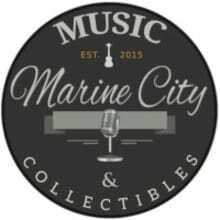 We are a family-run music shop located in the heart of historic downtown Marine City. We specialize in guitars and guitar accessories. Damaged and Defective Items: At our discretion we will replace, repair or provide a refund for damaged and defective items. Proof of damage may be required. Please contact us for details. We must be notified within 72 hours of receiving a damaged or defective item. Refunds will be given as money back for item only. We reserve the right to charge up to a 5% re-stocking / handling fee on all returns.